The right side of things is recognized in many ways as better than the left. The south and north sides of the earth are distinguished as "yamin" (right) and "sem'ol' (left; Job xxiii. 9), the right being the sunnier, brighter side, and the left the bleak and dark side, ill-omened and unlucky, where evil generates. "Out of the north an evil shall break forth upon all the inhabitants of the land" (Jer. i. 14). The right side, or right limb, of a person receives special prominence; the place of honor is at his right. "Upon thy right hand did stand the queen" (Ps. xlv. 9). Solomon placed a seat of honor for his mother, the queen, on his right side (I Kings ii. 19). The right eye was the most important and most vital member of the body. Nahash the Ammonite, as a reproach upon all Israel, purposed putting out the right eye of all men in Jabesh-gilead (I Sam. xi. 2). The prophet predicted, "Wo to the idol shepherd that leaveth the flock! . . . his right eye shall be utterly darkened" (Zech. xi. 17). The priest in purifying the leper put some of the blood of the sacrifice on the tip of his right ear, the thumb of his right hand, and the great toe of his right foot; he also used his right finger to sprinkle the oil before the altar (Lev. xiv. 14, 16), and received as his share of the peace-offering the right shoulder (Lev. vii. 32). Jacob showed the significance of using the right hand in blessing by placing it on the head of Ephraim, whose tribe was thereby destined to become the greater nation, though Manasseh was older in years (Gen. xlviii. 17-19). "Right" is a synonym for "goodness" and "brightness," and "left" for "badness," "awkwardness," and "clumsiness." "A wise man's heart is at his right hand; but a fool's heart at his left" (Eccl. x. 2). 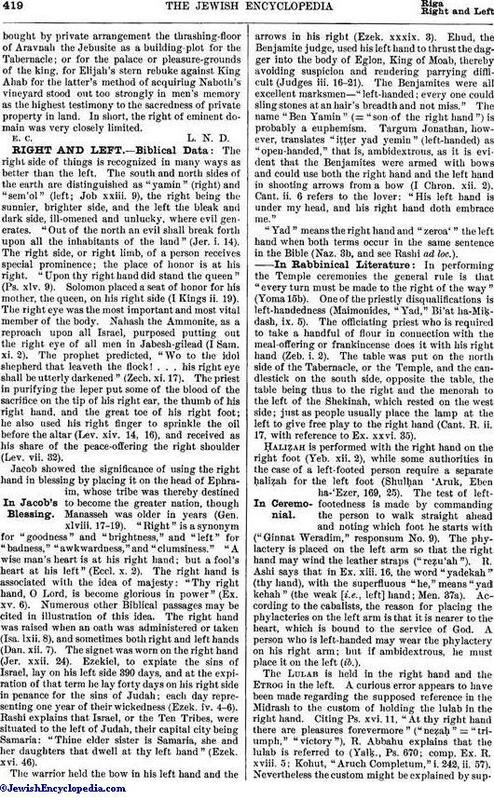 The right hand is associated with the idea of majesty: "Thy right hand, O Lord, is become glorious in power" (Ex. xv. 6). Numerous other Biblical passages may be cited in illustration of this idea. The right hand was raised when an oath was administered or taken (Isa. lxii. 8), and sometimes both right and left hands (Dan. xii. 7). The signet was worn on the right hand (Jer. xxii. 24). Ezekiel, to expiate the sins of Israel, lay on his left side 390 days, and at the expiration of that term he lay forty days on his right side in penance for the sins of Judah; each day representing one year of their wickedness (Ezek. iv. 4-6). Rashi explains that Israel, or the Ten Tribes, were situated to the left of Judah, their capital city being Samaria: "Thine elder sister is Samaria, she and her daughters that dwell at thy left hand" (Ezek. xvi. 46). The warrior held the bow in his left hand and the arrows in his right (Ezek. xxxix. 3). Ehud, the Benjamite judge, used his left hand to thrust the dagger into the body of Eglon, King of Moab, thereby avoiding suspicion and rendering parrying difficult (Judges iii. 16-21). The Benjamites were all excellent marksmen—"left-handed; every one could sling stones at an hair's breadth and not miss." The name "Ben Yamin" (= "son of the right hand") is probably a euphemism. Targum Jonathan, however, translates "iṭṭer yad yemin" (left-handed) as "open-handed," that is, ambidextrous, as it is evident that the Benjamites were armed with bows and could use both the right hand and the left hand in shooting arrows from a bow (I Chron. xii. 2). Cant. ii. 6 refers to the lover: "His left hand is under my head, and his right hand doth embrace me." "Yad" means the right hand and "zeroa' " the left hand when both terms occur in the same sentence in the Bible (Naz. 3b, and see Rashi ad loc.). In performing the Temple ceremonies the general rule is that "every turn must be made to the right of the way (Yoma 15b). One of the priestly disqualifications is left-handedness (Maimonides, "Yad," Bi'at ha-Miḳdash, ix. 5). The officiating priest who is required to take a handful of flour in connection with the meal-offering or frankincense does it with his right hand (Zeb. i. 2). The table was put on the north side of the Tabernacle, or the Temple, and the candlestick on the south side, opposite the table, the table being thus to the right and the menorah to the left of the Shekinah, which rested on the west side; just as people usually place the lamp at the left to give free play to the right hand (Cant. R. ii. 17, with reference to Ex. xxvi. 35). Ḥaliẓah is performed with the right hand on the right foot (Yeb. xii. 2), while some authorities in the case of a left-footed person require a separate ḥaliẓah for the left foot (Shulḥan 'Aruk, Eben ha-'Ezer, 169, 25). The test of left-footedness is made by commanding the person to walk straight ahead and noting which foot he starts with ("Ginnat Weradim," responsum No. 9). The phylactery is placed on the left arm so that the right hand may wind the leather straps ("reẓu'ah"). R. Ashi says that in Ex. xiii. 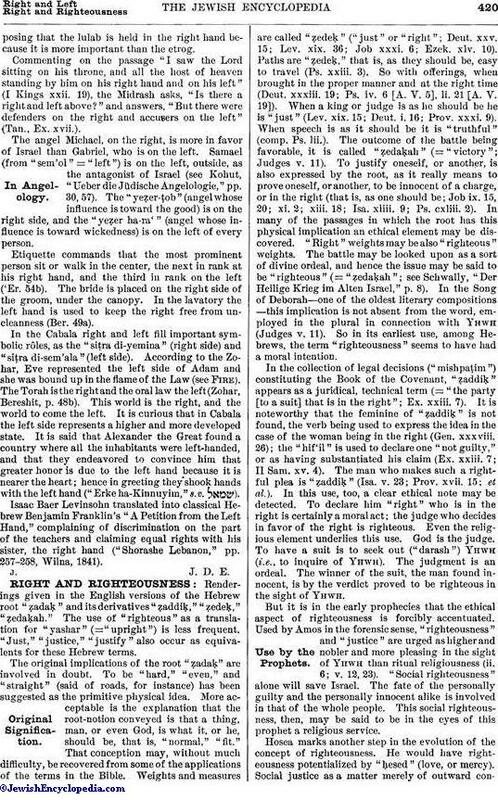 16, the word "yadekah" (thy hand), with the superfluous "he," means "yad kehah" (the weak [i.e., left] hand; Men. 37a). According to the cabalists, the reason for placing the phylacteries on the left arm is that it is nearer to the heart, which is bound to the service of God. A person who is left-handed may wear the phylactery on his right arm; but if ambidextrous, he must place it on the left (ib.). The Lulab is held in the right hand and the Etrog in the left. A curious error appears to have been made regarding the supposed reference in the Midrash to the custom of holding the lulab in the right hand. Citing Ps. xvi. 11, "At thy right hand there are pleasures forevermore" ("neẓaḥ" = "triumph," "victory"), R. Abbahu explains that the lulab is referred to (Yalḳ., Ps. 670; comp. Ex. R. xviii. 5; Kohut, "Aruch Completum," i. 242, ii. 57). Nevertheless the custom might be explained by supposingthat the lulab is held in the right hand because it is more important than the etrog. Commenting on the passage "I saw the Lord sitting on his throne, and all the host of heaven standing by him on his right hand and on his left" (I Kings xxii. 19), the Midrash, asks, "Is there a right and left above?" and answers, "But there were defenders on the right and accusers on the left" (Tan., Ex. xvii.). The angel Michael, on the right, is more in favor of Israel than Gabriel, who is on the left. Samael (from "sem'ol"="left") is on the left, outside, as the antagonist of Israel (see Kohut, "Ueber die Jüdische Angelologie," pp. 30, 57). The "yeẓer-ṭob" (angel whose influence is toward the good) is on the right side, and the "yeẓer ha-ra' " (angel whose influence is toward wickedness) is on the left of every person. Etiquette commands that the most prominent person sit or walk in the center, the next in rank at his right hand, and the third in rank on the left ('Er. 54b). The bride is placed on the right side of the groom, under the canopy. In the lavatory the left hand is used to keep the right free from uncleanness (Ber. 49a). In the Cabala right and left fill important symbolic rôles, as the "siṭra di-yemina" (right side) and "siṭra di-sem'ala" (left side). According to the Zohar, Eve represented the left side of Adam and she was bound up in the flame of the Law (see Fire). The Torah is the right and the oral law the left (Zohar, Bereshit, p. 48b). This world is the right, and the world to come the left. It is curious that in Cabala the left side represents a higher and more developed state. It is said that Alexander the Great found a country where all the inhabitants were left-handed, and that they endeavored to convince him that greater honor is due to the left hand because it is nearer the heart; hence in greeting they shook hands with the left hand ("Erke ha-Kinnuyim," s.v. ). Isaac Baer Levinsohn translated into classical Hebrew Benjamin Franklin's "A Petition from the Left Hand," complaining of discrimination on the part of the teachers and claiming equal rights with his sister, the right hand ("Shorashe Lebanon," pp. 257-258, Wilna, 1841).